Queen Victoria prohibited smoking not only in her presence but in any of her residences. This aversion to smoke carried into regular households where men wore smoking jackets to avoid having their dress coats smell of smoke. Plus, the rooms to which they were banished were much less comfortable than the ladies salons and the extra warmth was a boon. During Victoria’s reign, the British became enamored of silk and opulent fabrics and prints from the Near and Far East. These prints could be found in smoking jackets of brightly colored silks and velvets with frog closures. Our dashing smoking jackets are cut from a richly-appointed damask fabric with black velvet, shawl collar along with black trim on the collar and cuffs. Distinctive large frog closures fasten up the front. Fashioned from a blend of 80% polyester and 20% rayon with a 100% acetate lining and are available in sizes S-3X. Currently the brocade fabric is only available in 2 colors, Burgundy and Red, but more colors are coming soon! 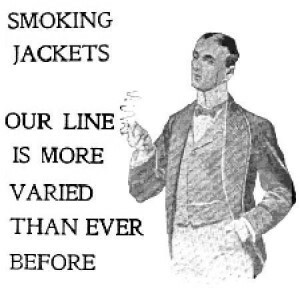 Click here to see our entire Vintage Smoking Jacket line offered in Brocade and Velvet! What do you think of these handsome new jackets? Let us know in the comments below! Then send us a photo, while wearing it, and enter our Monthly Customer Photo Contest. Click here for Rules and Entry!